SWI/SNF chromatin remodeling enzymes play a critical role in the development of T helper lymphocytes, including Th2 cells, and directly program chromatin structure at Th2 cytokine genes. Different versions of SWI/SNF complexes, including BAF and PBAF, have been described based on unique subunit composition. However, the relative role of BAF and PBAF in Th cell function and cytokine expression has not been reported. Here we examine the role of the PBAF SWI/SNF complex in Th cell development and gene expression using mice deficient for a PBAF-specific component, BAF180. We find that T cell development in the thymus and lymphoid periphery is largely normal when the BAF180 gene is deleted late in thymic development. 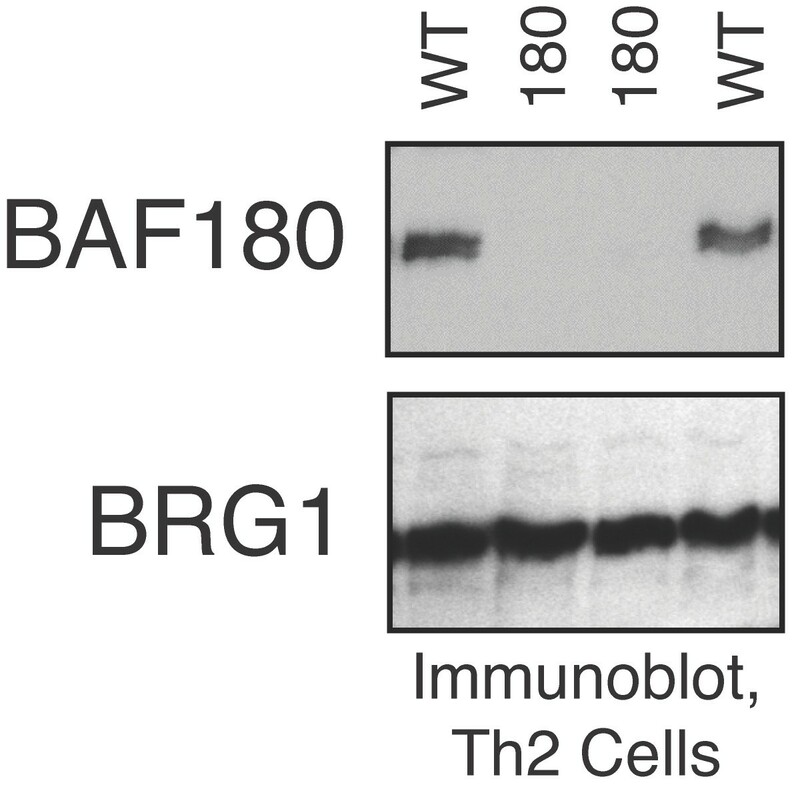 However, BAF180-deficient Th2 cells express high levels of the immunoregulatory cytokine IL-10. 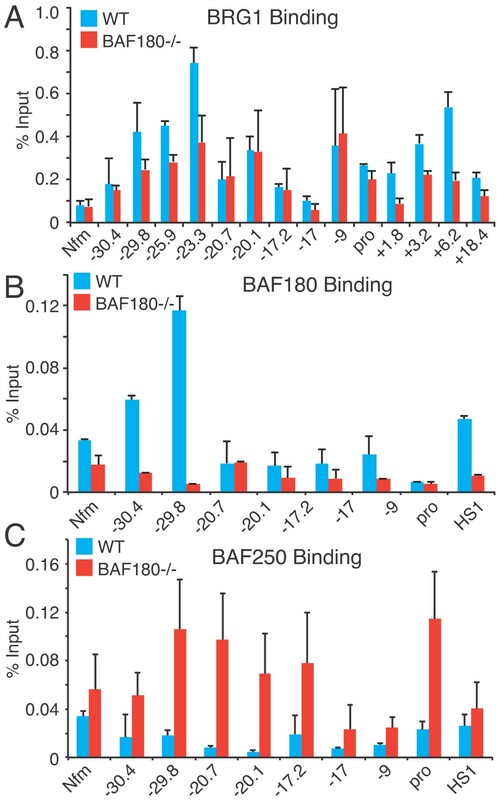 BAF180 binds directly to regulatory elements in the Il-10 locus but is replaced by BAF250 BAF complexes in the absence of BAF180, resulting in increased histone acetylation and CBP recruitment to the IL-10 locus. These results demonstrate that BAF180 is a repressor of IL-10 transcription in Th2 cells and suggest that the differential recruitment of different SWI/SNF subtypes can have direct consequences on chromatin structure and gene transcription. In T cells, chromatin structure can be dependent on cell fate, cell activation, or both. This is well illustrated in the case of the Th2 cytokine cluster, containing the Th2 cytokines IL-4, IL-5 and IL-13 [1, 2]. The Th2 cytokines are exclusively expressed in Th cells that have differentiated into the Th2 lineage and only upon T cell activation. DNase I hypersensitivity site (DHS) mapping of the cytokine loci from different Th subsets revealed dramatic changes in chromatin accessibility across the locus in Th2 cells compared to other Th lineages and undifferentiated Th precursors (Thps); typically, DHS are nucleosome-free regions created by chromatin remodeling proteins directed by the binding of transcription factors [2, 3]. Many of the DHS were subsequently determined both genetically and biochemically to be enhancer and silencer elements important to Th2 cytokine expression and were marked with lineage-specific changes in histone modifications [2, 3]. Although changes in nuclease accessibility across cytokine loci in response to differentiation and activation signals have been well documented, less is known about to the specific enzymes responsible for these changes . IL-10 was originally described as a Th2-specific cytokine, and the IL-10 gene is located on a different chromosome from the Th2 cytokine gene cluster . 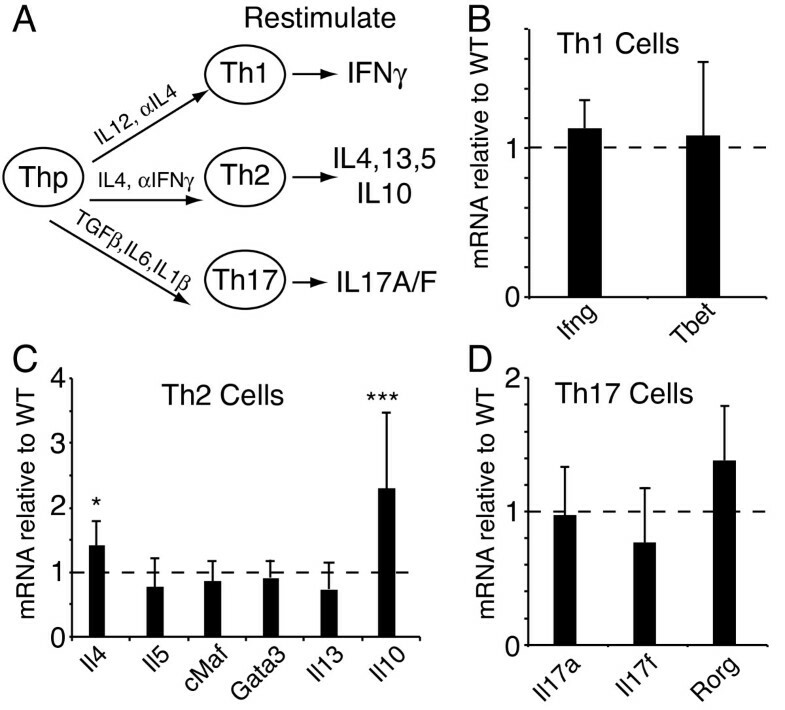 Like the Th2 cytokines, IL-10 expression in Th2 cells is accompanied by changes in the accessibility in the IL-10 locus directed by both lineage and activation-specific signals [6–8]. More recently the expression of IL-10 has been shown to be less restricted and more plastic than the classical Th2 cytokines. Both Th1 and Th17 cells can express IL-10 under specific conditions, while the newly described Th9 subset produces high levels of IL-10 along with IL-9 [9–11]. Biologically, IL-10 exhibits strong immunosuppressive effects and serves to attenuate immune responses. This is illustrated in the development of profound inflammatory bowel disease and exaggerated immune responses in IL-10-deficient mice . Indeed, some Treg cell populations, critical for the negative regulation of immune responses, mediate their activity through IL-10 expression [13, 14]. A number of studies have linked genetic variants at the IL-10 gene to human disease [15–18]. ATP-dependent remodeling enzymes contain SWI2/SNF2-like ATPase subunits, and these ATPases couple the hydrolysis of ATP to changes in chromatin structure. SWI/SNF, Mi2, ISWI, and other ATP-dependent remodeling enzymes are classified into subfamilies based upon homology of the ATPase subunit [4, 19, 20]. These remodeling enzymes appear to both activate and repress gene expression [4, 21–25]. SWI/SNF complexes are arguably the best-characterized ATP-dependent remodeling enzymes in T lymphocytes, with demonstrated functions in both early T cell development and T cell effector function [4, 26]. Mammalian SWI/SNF complexes contain one copy of either the BRG1 or Brm ATPase, and approximately 10 additional accessory subunits to form complexes that are generally over a megadalton in size. Two versions of SWI/SNF complex, BAF and PBAF, have been described, based on subunit composition [25, 27–32], as well as other complexes specific to ES cells and neurons [33, 34]. For example, BAF complexes contain either the BRG1 or Brm ATPase, and either BAF250a or BAF250b. PBAF complexes contain BAF180, BAF200 and the BRG1 ATPase but not Brm. Importantly, BAF and PBAF complexes appear to regulate different target genes [29, 31]. Previous we identified BAF250-containing BAF complexes as important chromatin remodelers of cytokine loci in T cells [24, 35] and, in ES cells, regulators of pluripotency and self-renewal [36, 37]. BAF complexes have established roles in cell cycle  and tumorigenesis . PBAF complexes are known to be important in coronary development [40, 41]. However, a role for PBAF complexes in T cell differentiation and effector function has not been explored. The PBAF specific SWI/SNF component, BAF180 or polybromo (Pbrm1), appears to direct the regulation of a unique set of target genes . BAF180-deficient mice have defects in cardiac development that include the specific misregulation of retinoic acid-induced genes . BAF180 also plays an important role in the regulation of the cell cycle due, at least in part, to its ability to activate the transcription of the cell cycle regulator p21 [43, 44]. BAF180 mutations have been identified in breast and renal cancers suggesting BAF180 is a tumor suppressor gene [44, 45]. Mutation of another PBAF component, BAF200/Arid2, is found in hepatocellular carcinoma . The BAF180 protein includes an HMG DNA binding domain, two bromo-adjacent homology domains involved in protein-protein interactions and an array of six tandem bromodomains shown to bind to specific acetylated histone residues . Recruitment of BAF180 to its specific gene targets has been suggested to involve interactions with other proteins, including transcription factors, and the recognition of specific histone signatures. In this study we examine the role of BAF180-containing PBAF complexes in CD4+ T cells. Using cells from mice conditionally deleted for BAF180 in T cells, we found that overall thymus and peripheral T cell development was intact. Additionally, the ex-vivo differentiation of CD4 T helper cells into different effector fates was not absolutely dependent on BAF180. However, BAF180 appeared to function as a repressor of the immunoregulatory cytokine, IL-10, in Th2 cells. BAF180 bound directly to regulatory elements in the Il-10 locus but was replaced by BAF250-containing BAF complexes in the absence of BAF180, resulting in increased histone acetylation and CBP recruitment to the IL-10 locus. These results suggest that the differential recruitment of different SWI/SNF subtypes (BAF and PBAF) can have direct consequences on gene transcription and cell fate in T cells. The generation of BAF180 conditional KO ES cell lines and mice are similar to that applied in BAF250a KOs . The BAF180 genomic sequences used for generating the initial KOs  were subcloned into the conditional KO vector . The generation of BAF180 conditional KO ES cell lines and mice are similar to that applied in BAF250a KOs . Briefly, two FRT and two loxp sites, together with a polylinker sequence, were engineered into a vector containing a promoterless β-geo trapping cassette derived from pGT1. DNA fragments ~4 kb in length were PCR-amplified from genomic DNA 5' and 3' of exon 11 of BAF180 and inserted into the targeting vector as applied previously for conventional BAF180 KO. A 0.5-kb fragment containing exon 11 was PCR-amplified and inserted upstream of the β-geo trapping cassette. The BAF180 conditional knockout vector was linearized by NotI digestion and electroporated into E14 feeder-independent ES cells to generate heterozygous ES lines after selection in G418. Targeted ES lines were confirmed by Southern analysis. Spe I digestion produces a 7.8-kb fragment for wild type (WT) allele and a 5.9-kb fragment for a mutant allele. The probe used is located between the Spe I sites and distal to the 5' recombination region as applied previously for conventional BAF180 KO. BAF180 heterozygous mice were obtained as described and these mice were kept in a B6-129 mixed genetic background before they were crossed to CD4-Cre mice. All other procedures were as described previously . CD4-Cre mice were obtained from Taconic. Animal approval was from the NIA ACUC, protocol ASP-365-MJP-Mi, and all experiments conform to the relevant regulatory standards. Mouse T cells were isolated and cultured essentially as described previously [24, 47]. Naïve Thp cells were purified from lymph node and spleens by using CD4 + CD62+ T cell isolation kit (Miltenyi) to 95% purity. Lymphocytes were cultured in RPMI 1640 supplemented with 10% FCS, 100 U/ml penicillin, 100 μg/ml streptomycin, 1 mM Sodium Pyruvate, 2 mM L-glutamine, 25 mM Hepes, 50 μM β-mercaptoethanol. Purified naïve Thp cells were plated onto anti-CD3 (1 μg/ml), anti-CD28 (2 μg/ml) coated plates at 1-2 × 106 in the presence of 10 ng/ml IL-4, 10 μg/ml anti-IFNγ (Th2 conditions) or 1 ng/ml IL-12, 10 μg/ml anti-IL-4 (Th1 conditions). IL-2 (100 U/ml) was added 24 h later. Cultures were expanded in IL-2 (100 U/ml) 3 days after initial culture. For Th17 differentiation naïve Thp cells were cultured with soluble anti-CD3 (4 μg/ml), soluble anti-CD28 (1 μg/ml), 10 μg/ml of both anti-IL-4 and anti-IFNγ, 100 ng/ml IL-6, 10 ng/ml IL-1β and 1 ng/ml TGF-β. Th17 cells were expanded in 10 ng/ml IL-23. Proper differentiation was confirmed by intracellular cytokine staining for Th lineage signature cytokines and mRNA analysis. Cells were stained, then analyzed on a FACSCalibur (BD Biosciences) using CellQuest software and standard methods. Fluorescently labeled antibodies to CD4, CD62L, CD44, CD8, CD3, and B220 were all purchased from BD Pharmingen. Before staining, Fc receptors were blocked with anti-CD16/32 Ab (BD Pharmingen). Negative controls consisted of isotype-matched, conjugated, nonspecific Abs (BD Pharmingen). Intracellular cytokine staining was performed using the Intracellular Cytokine Staining Kit (BD Pharmingen). Briefly, the cells were stimulated with PMA and Ionomycin for 4 hours in the presence of brefeldin A. The cells were fixed with paraformaldehyde, permeabilized and subsequently stained for cytokine expression using antibodies purchased from BD Pharmingen. Cell Proliferation Assay (Invitrogen). Fluorescence was measured on a CytoFluor 4000 fluorescent plate reader. Each bar is the average and standard deviation of three wells and representative of three independent experiments. Total RNA was purified using RNeasy columns (Qiagen). cDNA was made using iScript (BioRad) according to the manufacturer's instructions. Steady state mRNA levels of indicated genes were determined by real time PCR using SYBR green (Qiagen) on an ABI 7500. Ongoing transcription of IL-10 was measured by detection of the IL-10 primary (unspliced) transcript. Expression levels were normalized to mTBP [24, 48] or m-actin as indicated. Oligo sequences are in Table 1; IL-10 primary transcript oligo pair is IL-10 pri. Expression changes for individual genes were considered significant if they met four criteria: Z-Ratio above 1.5 or below -1.5; false detection rate (FDR)  of less than 0.30; a P-value statistic for Z-Score replicability below 0.05; and mean background-corrected signal intensity greater than zero. Differentially expressed genes were identified as significant (p < 0.05) based on Z-scores. Gene set analysis using GO gene sets with the PAGE  algorithm was performed as previously described . The data are publicly available at GEO (GSE31676). Whole cell extracts were prepared from Th2 cells by lysing cells in 50 mM Tris 7.4, 1% NP40, 150 mM NaCl, 0.5% Deoxycholate, 0.1% SDS and clearing the lysates by centrifugation. Protein extracts were separated on a 6% polyacrylamide gel and transferred to a PVDF membrane (BioRad). The immunoblots were blocked for 1 h at room temperature in 5% milk in TBST (50 mM Tris pH7.5, 100 mM NaCl, 0.03% Tween 20) and incubated with the BAF180 antibody (Bethyl A301-590A) or BRG1 antibody (Upstate/Millipore 07-478) overnight at 4°C. The blots were washed with TBST and incubated with anti-rabbit HRP-conjugated antibody (Zymed) at room temperature. After washing the blots with TBST, detection was carried out using enhanced chemiluminescence (Amersham) according to manufacturer's instructions. Chromatin immunoprecipitation was performed using methods similar to those described previously [21, 24, 47, 54]; details are available on request. Approximately 20 million cells (for 3-5 immunoprecipitations) were crosslinked with 1% formaldehyde and quenched with glycine. Cells were lysed with buffer containing 1% SDS, treated with micrococcal nuclease, sonicated until the average DNA size was approximately 500 bp, and adjusted to 0.1% SDS, 1% Triton X-100 and 150 mM NaCl at 5 ml. Sonicates were precleared with protein A Sepharose (Upstate) and IP was performed with the following antibodies: 1 ug H3K9Ac (Abcam ab4441), 0.5 ul BRG1 (J1, Weidong Wang), 1 ug H3K18Ac (Abcam ab1191), 1 ug H3K4Me (Abcam ab8895), 2 ug BAF180 (A301-591A Bethyl Laboratories), 2 ug BAF250 (A301-041A Bethyl Laboratories), 1 ug CBP (Assay Biotech Ab-1535) or rabbit IgG (Santa Cruz sc-2027). Chromatin was collected with protein A, washed, eluted with TE pH 10.0 and crosslinks were reversed, followed by protease treatment. Chromatin was quantified by real-time PCR (Q-PCR) using an Applied Biosystems 7500 with Sybr Green detection (Biorad). Graphs indicate immunoprecipitated chromatin amounts relative to input DNA (% input). Oligo sequences are in Table 2. Previous work from our laboratory identified a role for BRG-containing SWI/SNF complexes in the differentiation of Th2 cells as well as in the acute induction cytokine genes from Th2 and IL-3/GMCSF loci [24, 35]. Additionally, using siRNA technology in effector Th cells we identified BAF250a-containing BAF complexes as an important SWI/SNF component in Th2 and IL-3/GMCSF cytokine expression [24, 35]. By contrast, we did not identify a role for BAF180-containing PBAF complexes in effector Th2 cytokine expression and did not explore the role of BAF180 in Th2 differentiation. 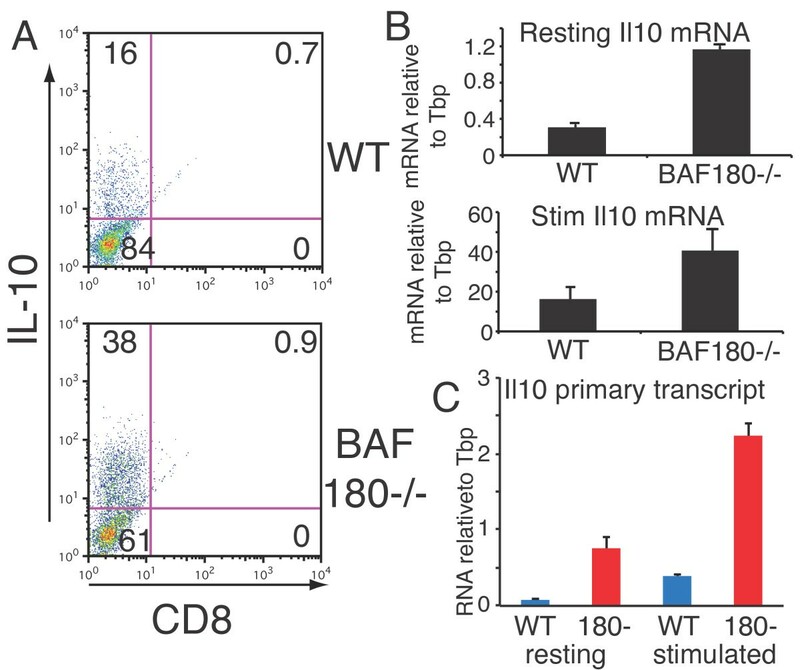 However, it remained possible that the siRNA-mediated partial depletion of BAF180 was not sufficient to reveal the role of BAF180 in T cells. To more thoroughly explore this issue we made use of a mouse strain made conditionally deficient for BAF180 in T cells . Since we were testing the role of BAF180 in peripheral CD4 T cell function, we chose the CD4 promoter/enhancer driver for cre recombinase expression, as this expression cassette is expressed at a relatively late stage of thymocyte development ; we also expected T cell specific deletion would bypass the coronary and trophoblast defects occurring in embryos lacking BAF180 . As expected, in the presence of the cre recombinase transgene, we observed complete loss of BAF180 protein expression in T cells from BAF180fl/fl mice (Figure 1). By contrast, there was little if any effect on BRG1, another SWI/SNF component. Loss of BAF180 protein expression did not grossly affect cell number from the thymus, spleen or lymph nodes (Figure 2A, B and data not shown) suggesting that overall T cell development and expansion was not strongly affected by the loss of BAF180 at this late stage. This was further supported by FACS analysis showing typical staining profiles for CD4 and CD8 T cell subsets in both the thymus and lymphoid periphery, as well as typical T:B cell ratios in the spleen (Figures 2B, C, D and 3A). T cell specific deletion of BAF180 Immunoblot of proteins from wild-type (WT) and BAF180-/- (180) Th2 cells. BAF180 (upper panel) and BRG1 (lower panel) were visualized. 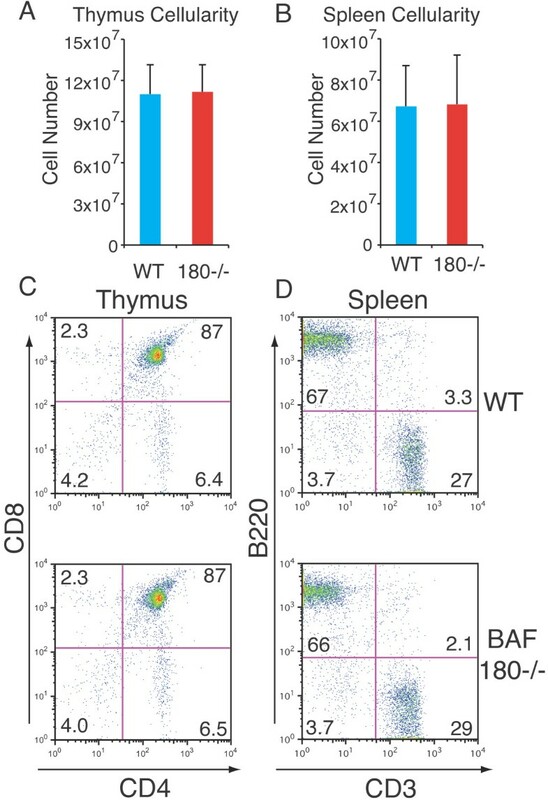 T cell specific deletion of BAF180 has little or no effect on T cell development A,B) Cell numbers of A) thymus and B) spleen from wild-type (WT) and BAF180-/- (180-/-) mice, n = 5 pairs of mice. C,D) Cell surface staining of C) CD8 and CD4 expression on thymocytes and D) B220 and CD3 expression on splenocytes from WT and BAF180-/- mice. Cell surface markers and proliferation of BAF180-deficient Th cells A ) Cell surface staining of lymph nodes from WT (upper) and BAF180-/- (lower) mice, as a function of CD4 expression. CD8 (left), CD44 (middle) and CD62L (right) were detected. 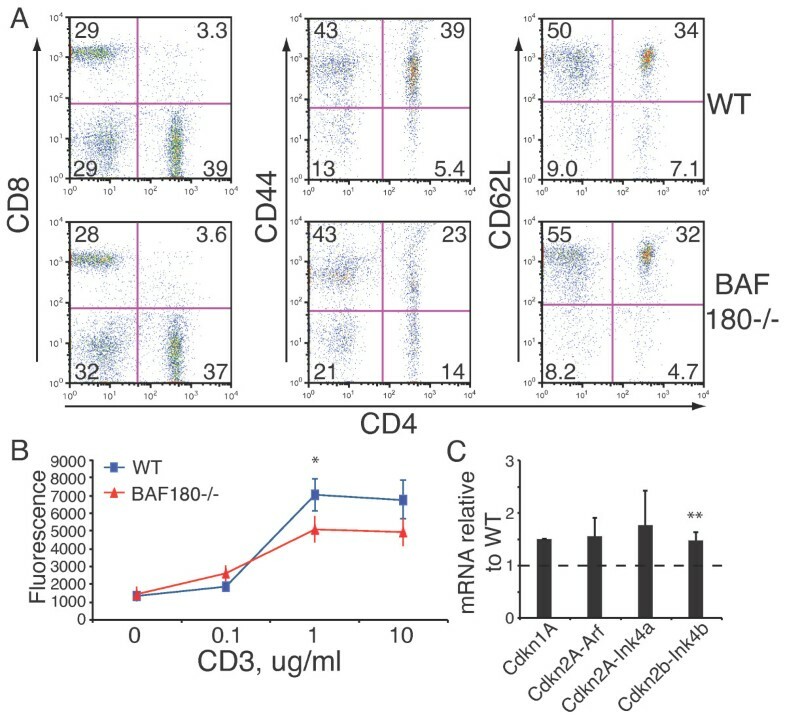 B) Proliferation of CD4+ T cells purified from WT and BAF180-/- mice using the indicated concentration of plate bound anti-CD3 antibody and 1 μg/ml anti-CD28. Asterisk indicates p < 0.05. C) Cell cycle inhibitor RNA expression in restimulated Th2 cells from WT and BAF180-deficient mice was quantified by real time RT-PCR and normalized to WT values. n = 3. Double asterisk indicates p < 0.01; paired T-test values were Cdkn1A, 0.07; Cdkn2A-Arf, 0.21; Cdkn2A-Ink4a, 0.25, and Cdkn2B-Ink4B, 0.005. In stimulated naïve cells, the ratios/p values were Cdkn1A, 2.27/0.40; Cdkn2A-Arf, 3.34/0.02, Cdkn2A-Ink4a, 4.14/0.18, and Cdkn2B-Ink4B, 2.20/0.07. We detected two subtle changes in BAF180-deficient peripheral CD4 T cells. First, although the naïve and central memory marker CD62L was unchanged in BAF180-deficient T cells, we observed a general down-regulation of the memory marker CD44 in peripheral T cells (Figure 3A). We do not know whether the loss of CD44 expression was a direct consequence of reduced CD44 transcription when BAF180 no longer functions on the CD44 gene, or alternatively an indirect effect of altered memory cell function in the absence of BAF180. In support of the former possibility, CD44 was one of the first bona fide SWI/SNF target genes identified in mammalian cells . Additionally, we observed direct recruitment of PBAF complexes to multiple transcriptional elements in the CD44 gene (data not shown) suggesting that BAF180 was a direct positive regulator of CD44 expression in T cells. Second, BAF180-deficient CD4 T cells consistently displayed a slight decrease in proliferative response to T cell stimulation (Figure 3B). This correlated with a small increase in the expression of cell cycle inhibitors in BAF180-deficient T cells (Figure 3C). In order to determine if BAF180 is involved in Th differentiation, we purified naïve CD4 T cells (Thp) from wildtype and BAF180-deficient mice and cultured the cells under Th1, Th2 and Th17 skewing conditions (Figure 4A); throughout this study, restimulated cells were activated with PMA and ionomycin. Analysis of expression of Th-subset specific cytokines and transcription factors revealed that, in the absence of BAF180, Th-differentiation was largely intact (Figure 4B, C, D). Additionally, BAF180-deficient T cells expanded similarly to wildtype T cells when cultured under skewing conditions with exogenous cytokines. We did consistently observe a slight enhancement of IL-4 expression and a larger increase in IL-10 expression in BAF180-deficient Th2 cells (Figure 4C). These results suggest that BAF180-deficient Th cells are largely capable of differentiating into several Th lineages and express Th cytokines appropriately. However, BAF180 appeared to repress IL-10 and perhaps IL-4 in Th2 cells. Th differentiation in the absence of BAF180 A) Scheme for differentiation of T helper cells in culture, and restimulation with PMA/ionomycin. B) Th1 cytokine and transcription factor expression as assessed by real time RT-PCR in WT and BAF180-/- stimulated Th1 cells. C) Th2 cytokine and transcription factor expression as assessed by real time RT-PCR comparing WT and BAF180-/- stimulated Th2 cells. D) Th17 cytokine and transcription factor expression as assessed by real time RT-PCR in WT and BAF180-/- stimulated Th17 cells. Results are the average and standard deviation of four independent experiments. The change in IL-10 was statistically significant (p < 0.005), the change in IL-4 was significant (p < 0.05) while none of the other tests here were significant. After observing some changes in candidate gene expression in BAF180-deficient Th2 cells, we expanded our analysis in a comprehensive, unbiased manner using beadchip analysis. We identified BAF180-dependent gene expression in resting and restimulated Th2 cells and Naïve CD4+ Th cells; primary data were deposited in GEO (GSE31676). We found the expression of approximately 1,100 genes was augmented or diminished in a statistically significant manner, following depletion of BAF180 protein in one or more of these conditions (Figure 5). More genes were affected in resting cells than in stimulated cells. In resting cells, more genes were upregulated than downregulated after deletion of BAF180, suggesting the major function of BAF180 in resting Th cells was to repress gene expression. More genes were affected in differentiated cells than in Naïve cells. BAF180-dependent gene expression changes in Th2 cells Upregulated and downregulated genes were counted in each cell type, after removing genes that were not expressed, and removing genes without statistically significant changes. Total is the sum of upregulated and downregulated genes within a cell type. Cell types are listed below the graph; "Any" is a count of every gene that is regulated under at least one condition. Array data were derived from 3 pairs of WT and BAF180-/- mice. Data are deposited in GEO (GSE31676). Among GO term gene sets in stimulated Th2 cells, decreased expression in pathways involving nucleosome assembly, transcription and DNA binding were evident in BAF180-deficient Th2 cells, while pathways involving ribosome biogenesis and translation were increased. Pathways altered in BAF180-/- Th2 cells involving immune cell function included "Positive Regulation of T cell Differentiation" and "Natural Killer Cell Activation". Genes that appeared to be repressed by BAF180 in Th2 cells included IL-10, Il2ra, Furin, Ctla4, Icos, Foxp3, Rgs1, Nras, E2f6, E2f1, Cdkn2a, Nfil3 and Jmjd1a. Genes that appeared to be activated by BAF180 in Th2 cells included Cd28, Stat1, Jak2, Twistnb, Daxx, Igf1r, Prkca, Chd4 Bcl2 Cdk2, Rb1, Ikbke, Egr1, and Adar. In Naïve cells, repressed genes included Cdkn1a, Foxp3, Gata3, Ifng, Il17f, Dnmt3b, while activated genes included Dicer1, Gadd45a, and Smad1. We note we had also identified Cdkn1a and Cdkn2a as repression targets using a candidate gene approach (Figure 3C). BAF180 repression targets in resting and stimulated Th2 cells were largely distinct; only a small number of targets were shared. Interestingly, the gene most enhanced by BAF180-deficiency in both resting and activated Th2 cells was IL-10 suggesting a role for BAF180 in the down-regulation of this cytokine. We validated the IL-10 expression changes in BAF180-deficient Th2 cells at both the protein and RNA level. Using intracellular cytokine staining, we observed that the number of IL-10 producing Th2 cells increased from 16% to 38% in the absence of BAF180 (Figure 6A). This correlated well with 2-4 fold enhanced IL-10 mRNA production in both resting and activated BAF180-deficient Th2 cells (Figure 6B). To determine if the enhanced IL-10 expression was due to increased transcription, we quantified the IL-10 primary (unspliced) transcript and similarly found an increase of at least 4 fold in resting and activated BAF180-/- cells (Figure 6C). (Incidentally, stimulation increased the IL-10 primary transcript 5 fold (Figure 6C) in WT cells, while the mRNA increased 50 fold (Figure 6B) and 10 fold (microarray experiment); while these differences may reflect experiment to experiment variation, they also provide some support for regulation of IL-10 mRNA stability.) These results demonstrate that the transcription of IL-10 is elevated in the absence of BAF180 and suggest that BAF180 is a repressor of IL-10 transcription. BAF180 is a repressor of IL-10 transcription in Th2 cells A) Intracellular staining for IL-10 protein in WT and BAF180-/- Th2 cells. B) IL-10 mRNA was quantified by real time RT-PCR from resting and activated Th2 cells. C) IL-10 primary transcripts were quantified by RT-PCR using primers specific to primary transcripts including intronic sequences from IL-10 locus. The results in B and C are the average and standard deviation of two independent experiments. The IL-10 locus is marked by a number chromatin structure changes in Th2 cells in response to both activation and lineage-specific signals [6–8]. These modifications include histone acetylation, methylation and the generation of DNase I hypersensitive sites present over many kilobases upstream and downstream the IL-10 coding sequence. We examined the landscape of BRG1 binding and STAT transcription factor binding at this locus using ChIP-seq data. We found BRG1 at several regions near the IL-10 gene (Figure 7). Binding was strongest at regions upstream and downstream from the IL-10 promoter than at the promoter itself, as seen previously with cytokine genes [21, 24, 35, 47]. More and stronger BRG1 binding was found in stimulated cells than in resting cells, and in Th2 fate than in other fates. BRG1 binding was statistically significant at -25.9 k, -23.4 k, -20 k, -9 k, +6.2 k, +9.6 k, and +18.5 k. Previous studies found DNase hypersensitivity at most of these sites [6–8]; BRG1 has previously been found to play a role in formation of DHS [24, 35, 47]. We note that STAT transcription factor binding overlaps with a number of these sites, and suggest that transcription-factor mediated recruitment might explain some of the observed BRG1 binding. 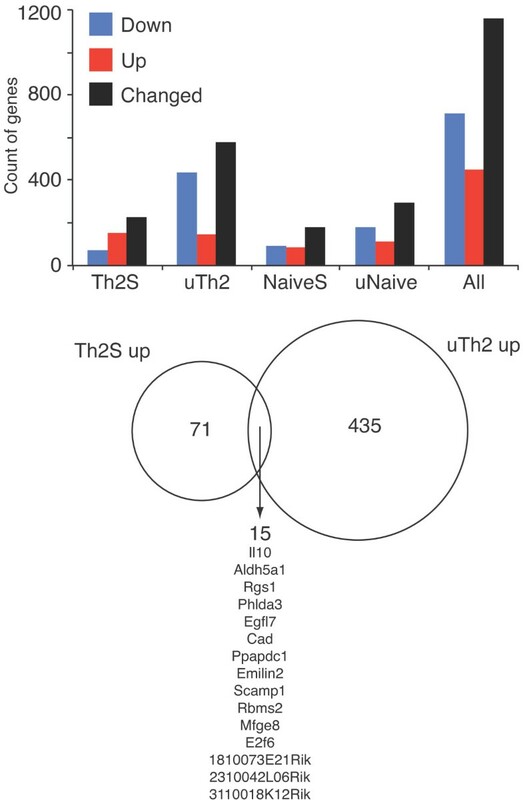 Interestingly, STAT4 binding occurs in Th1 cells at locations lacking STAT6 in Th2 cells; these could be negatively acting sites. 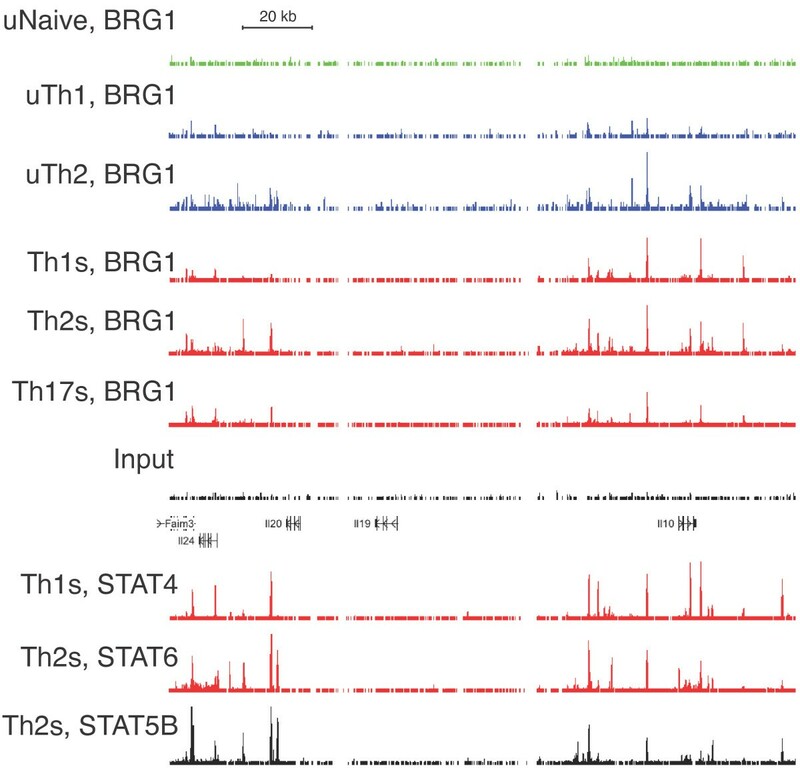 BRG1 and transcription factor binding at the IL-10 locus in multiple T helper subtypes. ChIP-seq profiles from T helper cells for BRG1, STAT6, STAT4 and STAT5B are shown. BRG1 data are from , Stat6 data are from  and Stat5 data are from . Resting naïve cells (uNaive), resting Th1, (uTh1), resting Th2 (uTh2), re-stimulated Th1 (Th1s), re-stimulated Th2 (Th2s), re-stimulated Th17 (Th17s) cells are shown. Input is shown as a control. Occupancy range values (y axis) are identical for all graphs to allow direct comparison (minimum tag frequency of 0, maximum tag frequency of 1.14 × 10-5). A scale bar for the × axis (genomic location) is shown. IL-10 exons are indicated as vertical bars, and an arrow indicates the direction of transcription; vertical arrows indicate features analyzed in other figures, and their distance relative to the IL-10 promoter. The genomic coordinates represented (MM9 assembly) are chromosome 1, 132,870,000 to 132,940,000. We examined BRG1, BAF180, and BAF250 binding at the IL-10 locus using ChIP-PCR. We found BRG1 binding at several regions, consistent with the ChIP-seq results (Figure 8A); BRG1 binding was strongest at -29.8 k, -25.9 k, -23.3 k, -9 k, and +6.2 k. BRG1 binding was low in naïve cells, induced during differentiation, decreased in resting cells, and was strongest in re-stimulated cells (data not shown), as seen with the Th2 cytokine loci . We found BRG1 was required during Th2 differentiation to establish DHS at -9 k and +1.8 k (data not shown), as found previously at the IL-4 and GATA3 promoters . The binding of the BRG1 paralog Brm was similar to BRG1 (data not shown). BRG1 binding was not affected by BAF180 deletion at some sites, such as -9 k, while other sites such as -29.8 k BRG1 and the above-mentioned STAT4 binding sites in Th1 cells, BRG1 binding was reduced. We next examined BAF180 binding to the IL-10 locus; we detected BAF180 binding especially at distal sites (-30.4 k, -29.8 k) and the IL-10 promoter in Th2 cells (Figure 8B). The pattern of BAF180 binding was similar to BRG1, with the prominent exception that little if any BAF180 binding occurred at -9 k, a strong BRG1 binding site. As expected, BAF180 binding was absent in BAF180-deficient Th2 cells (Figure 8B). Finally we measured BAF250a binding as a marker of BAF complexes. We detected enhanced binding of BAF250a to distal elements and the IL-10 promoter in BAF180-deficient Th2 cells compared to WT cells (Figure 8C). The strongest BAF250a binding was to the IL-10 promoter, a weak BRG1 site, while there was little if any BAF250a binding to -9 k, a strong BRG1 site. These results suggest that while overall SWI/SNF recruitment is not strongly affected by BAF180-deficiency, the composition of the SWI/SNF complex (BAF vs PBAF) is altered and thus changing the composition of SWI/SNF changes IL-10 gene expression. Enhanced BAF250 recruitment to IL-10 locus in stimulated Th2 cells in the absence of BAF180 Binding of BRG1, BAF180 and BAF250 was detected by ChIP-PCR at the indicated sites in the IL-10 locus. Signal is expressed as percent of the input chromatin. Control IP levels are less than 0.05% input. Nfm is a locus in the neuron-specific medium neurofilament gene, a binding site for BRG1 in neurons and brain but not in T cells. The results are the average and standard deviation of three ChIP experiments. A) BRG1 binding. B) BAF180 binding. C) BAF250 binding. Next, we examined histone modifications and modifiers at the IL-10 locus using ChIP-PCR, as we had previously found BRG1 regulated histone acetylation . H3K4me1, a mark frequently found at enhancers, was found at all the tested regions of the IL-10 locus, especially at -29.8 k, -20.7 k, -20.1 k, and -9 k (Figure 9A, blue bars). H3K4me1 was not strongly affected by deletion of BAF180 (red bars), though IL-10 expression was enhanced in BAF180-deficient Th2 cells. H3K18ac and H3K9ac, marks that are enriched at active enhancers and promoters , were found at all the tested regions of the IL-10 locus; H3K18ac was especially prominent at -20.7 k and -20.1 k, H3K9ac especially at the promoter and downstream regions (blue bars). Histone acetylation was elevated in BAF180-deficient cells (Figure 9B and 9D, red bars); this difference was prominent at sites distal to the IL-10 promoter (-30.4 k, -29.8 k, -20.7 k, -20.1 k). These results suggested that the replacement of PBAF complexes with BAF complexes altered histone modifications of the locus, or alternatively that these histone modifications were acquired as a consequence of SWI/SNF-mediated transcriptional regulation. The CBP and p300 histone acetyltransferases been shown experimentally to generate the H3K18ac and H3K27ac modification [60, 61] associated with active enhancers and promoters [59, 62–65], and these paralogs bind similar targets . We found CBP binding to many of the tested regions in the IL-10 locus; we detected increased CBP recruitment to IL-10 enhancers and the IL-10 promoter in the absence of BAF180 (Figure 9C). Therefore, the composition of specific SWI/SNF complexes can influence histone acetyltransferase recruitment and histone acetylation; as the changes in histone modifications do not always coincide with changes in BAF180 binding, we do not know whether they are the result of looping, or spreading of histone modifications. These alterations in histone modifications might be programmed by SWI/SNF to direct transcription, or might be a consequence of transcription programmed by SWI/SNF. Enhanced histone acetylation and CBP recruitment to IL-10 locus in BAF180-deficient Th2 cells Histone modifications and binding of the histone acetyltransferase CBP were detected by ChIP-PCR at the indicated sites in the IL-10 locus. Signal is expressed as percent of the input chromatin. Control IP levels are less than 0.05% input. Nfm is a locus in the neuron-specific medium neurofilament gene, a binding site for BRG1 in neurons and brain but not in T cells. The results are the average and standard deviation of three ChIP experiments. A) Histone H3K4 monomethylation. B) Histone H3K18 acetylation. C) CBP binding. D) Histone H3K9 acetylation. IL-10 is part of a multi-gene cluster in mouse and human. A recent report indicated that IL-24 expression is Th2 specific, mediated in part by STAT6 function through the IL-24 promoter . We asked whether there might be functional elements dispersed throughout this locus, as found for the IL4/IL13/IL5 locus; these can be identified through genomic analysis, especially when multiple datasets are combined [4, 68]. We found BRG1 binding clustered around the IL-24 and IL-10 genes (Figure 10). There were few if any binding regions in the central 60 kb interval containing the IL-20 and IL-19 genes. In resting and stimulated cell types, BRG1 binding was Th2 specific, and binding was stronger in stimulated cells. Consistent with our previous global analysis and analysis of specific genes, these effects were not absolute; for example, there is substantial BRG1 binding in Th1 cells; it is not clear whether this is the result of combinatorial control, or if these sites can be both positively and negatively acting. STAT6 and STAT5 binding was present at numerous upstream and downstream regions, extending the observation of STAT6 at the IL-24 promoter. The location of statistically significant binding regions for both loci is presented as a table (See Additional file 1) of genomic coordinates and features, organized by factor/condition (By Factor tab) and by genomic coordinate (By site tab). We note that occupancy of the IL-19 -19.8 k and IL-10 +3.2 k sites was detected in cells that do not express these genes under these conditions; perhaps negative regulatory elements lie in these regions. We also note that the IL-10 -25.9 k, IL-10 -9 k, IL-10 +9.5 k, and IL-20 +8.6 k elements are bound by BRG1, STAT6, STAT5A and STAT5B; perhaps these are especially important positive elements. We have confirmed that these elements are DHS in Th2 cells (data not shown). BRG1 Binding at the IL-10/IL-24 Locus in multiple T helper subtypes. ChIP-seq profiles from T helper cells for BRG1, STAT6, STAT4 and STAT5B are shown. BRG1 data are from , Stat6 data are from  and Stat5 data are from . Resting naïve cells (uNaive), resting Th1, (uTh1), resting Th2 (uTh2), re-stimulated Th1 (Th1s), re-stimulated Th2 (Th2s), re-stimulated Th17 (Th17s) cells are shown. Input is shown as a control. Occupancy range values (y axis) are identical for all graphs to allow direct comparison (minimum tag frequency of 0, maximum tag frequency of 1.14 × 10-5). A scale bar for the × axis (genomic location) is shown. Exons are indicated as vertical bars, gene names are to the left, and arrowheads indicate the direction of transcription. The genomic coordinates represented (MM9 assembly) are chromosome 1, 132,770,000 to 132,950,000. We examined the role of ATP-dependent chromatin remodeling in T cell function. Our previous work identified an activating role for BAF complexes, SWI/SNF complexes containing BAF250, in cytokine gene expression in T helper cells [24, 35, 47]. In the current study we examined the contribution of PBAF, a different SWI/SNF complex containing BAF180, in T cell function and cytokine expression using T cell specific BAF180-deficient mice. We identified numerous BAF180-dependent changes in gene expression in our microarray analysis; however, overall Th cell development and cytokine expression were intact. BAF180 was a negative regulator of IL-10 transcription and, in the absence of BAF180, histone modifications were reprogrammed and BAF250-containing BAF complexes were recruited to the IL-10 locus. We find the binding patterns of BAF180 and BAF250 are overlapping, yet readily distinguishable. Our data are consistent with the model that SWI/SNF exists in distinct BAF and PBAF complexes, determined by several independent research groups examining different species. Our data are also consistent with a stepwise assembly model, as proposed based upon time-resolved cell imaging studies . These data are more difficult to reconcile with the proposal that BAF180 and BAF250 are, or can be, in the same complex [70, 71]. We note that genetic studies have found different targets and functions for the BAF-specific subunits BAF250a/Arid1a and BAF250b/Arid1b in ES cells [36, 37]. Differences have also been found for the PBAF-specific subunits BAF180, BAF200 and BRD7 [25, 31]. There may be different BAF and PBAF complexes; alternatively, it may be that only some SWI/SNF subunits within a complex contribute to function at a particular locus. Direct, comprehensive comparison of these subunits would extend our understanding of the SWI/SNF system. The targeting of remodeling complexes to specific DNA elements is mediated by association with transcription factors, histone modifications, non-coding RNA and interactions with the general transcription machinery [4, 42, 72–76]. 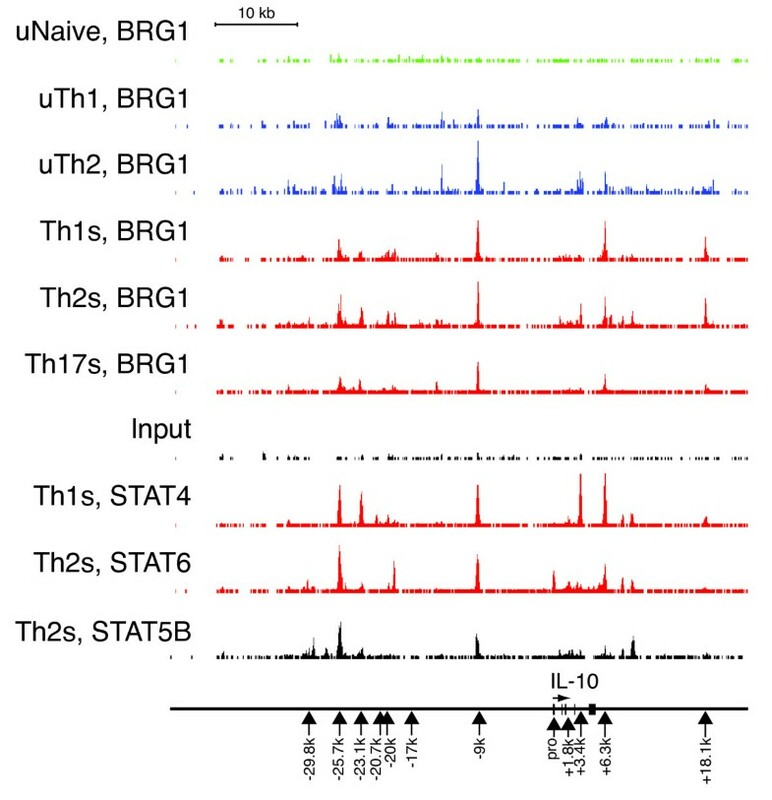 Our previous studies identified important roles for transcription factors, particularly STATs, in the recruitment of BRG1 to specific regulatory elements in T cells [4, 24, 47]. Interestingly, Stat6 has been shown to be a critical transcription factor in the Th2-specific expression of IL-10 and IL-24 [67, 77], and analysis of BRG1 and Stat6 ChIP-Seq data reveal Stat6 binding at many of the distal regulatory elements in the IL-10 locus occupied by BAF and PBAF complexes [47, 57]. Whether or not Stat6 is mediating the recruitment of SWI/SNF to the IL-10 locus or if Stat6 preferentially interacts with BAF or PBAF complexes remains to be determined. Ets-1 is reported to be a repressor of IL-10 expression [78, 79], and Ets sequence motifs are enriched at BRG1 binding sites in resting Th cells . Our recent examination of BRG1 did not reveal repression as a prominent function for SWI/SNF, by comparison of Th2S gene expression and BRG1 binding . We note that most BAF180-mediated repression was in uTh2 cells, and we did not examine resting cell gene expression in our previous work. Alternatively, there may be more SWI/SNF activation targets than repression targets; this assessment awaits analysis of BAF250a KO and BRG1 KO Th2 cells for direct comparison under identical conditions. A previous report suggested Brm more important for repression, BRG1 more important for activation . It is unclear how BAF180 complexes are mediating repression; they may be working as repressor complexes, or preventing the binding and function of activator complexes containing BAF250. It is perhaps surprising that we found that deletion of BAF180 (late in T cell development) does not strongly perturb early T cell development. We have used a CRE expression cassette that induces deletion at a late DN stage, potentially bypassing an earlier requirement for BAF180 expression. Several other factors, such as GATA3, BRG1, TCF7, β-catenin and BPTF, appear to be required for early T cell development [22, 81–85]. Given that BRG1 has obvious effects on T cell development, we could have found that BAF180 deletion would also have strong effects on T cell development. BAF180-deficient mice have defects in cardiac development  and BAF180 is a cell cycle regulator in some settings [43, 44]; it is not clear what determines the relative importance of PBAF complexes in different cell states. Genetic variants within IL-10 have been associated with human disease. The human SNP rs3024505, associated with Type 1 Diabetes, Crohn's disease and ulcerative colitis [15–17], maps to BRG1, STAT6, and STAT4 binding at +6.3 k in the mouse. Ulcerative colitis is also linked to rs3024493 , within intron 3; this is 1 k upstream of BRG1, STAT4 and CBP binding at +3.2 k, and slightly downstream of BRG1 binding and H3K9 acetylation at +1.8 k. Behcet's disease is associated with a variant (rs1800871) that lies near the IL-10 promoter , adjacent to BRG1, STAT6 and CBP binding. The proximity of these genetic variants to these remodeling enzyme and transcription factor binding regions suggests these binding regions may regulate IL-10 gene expression in a physiologically relevant manner. Previous studies on breast cancer cells suggested BAF180 is a tumor suppressor gene that positively regulates the expression of the cell cycle inhibitor p21 through direct interaction and activation of the p21 promoter . A positive role for BAF250a in the regulation of p21 transcription has been suggested in studies in a pre-osteoblast line . However BAF250a can also serve as a repressor of c-myc in these same cells while another BAF-specific protein, BAF250b, is an activator of c-myc . We observed a slight decrease in the ability of BAF180-deficient Th cells to proliferate in response to T cell activation and enhanced expression of cell cycle inhibitors, including p21 (CDKN1), suggesting that in T cells BAF180 is a repressor of these genes. We also observed binding of PBAF complexes to the p21 locus in T cells (data not shown). At this time, there is no simple relationship between BAF/PBAF complexes and cell cycle progression. The relative contribution of different SWI/SNF subtypes in T cell gene expression is largely unknown. Here we identify gene targets in Th2 cells regulated by the PBAF-specific SWI/SNF component, BAF180. In particular, we find that BAF180 is a repressor of IL-10 gene transcription. BAF180 binds directly to regulatory elements in the IL-10 locus but is replaced by the BAF-specific component, BAF250a, in the absence of BAF180, resulting in enhanced histone acetylation at the IL-10 locus. This study demonstrates that the differential recruitment of SWI/SNF subtypes can have direct consequences on chromatin structure and gene transcription. We thank Weidong Wang for helpful advice, and for the BRG1 J1 antibody. We also thank Sebastian Fugmann, Nan-ping Weng, Rebecca Potts for helpful discussions. This research was supported in part by the Intramural Research Program of the NIH, National Institute on Aging, 1 Z01 AG000524. The funders had no role in study design, data collection and analysis, decision to publish, or preparation of the manuscript. The authors have made the following declaration about their contributions: Conceived and designed the experiments: ALW, MJP, ZW Performed the experiments:, ALW, PP, WHW, MJP, Analyzed the data, ALW, YZ, KGB, MJP, Wrote the paper ALW, MJP. All authors read and approved the final manuscript.